Be sure to scroll to the end for 2 slide shows of photos and information from this Mission Trip. 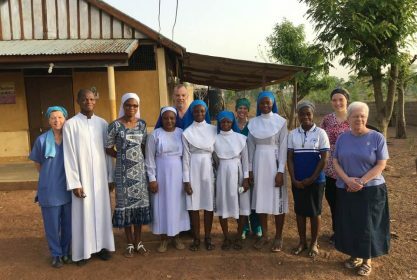 Sister Mary Elizabeth Looby, pictured above at far right, served in a remote village of Ghana. 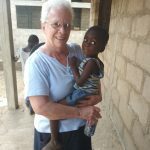 She stayed with a Congregation of Ghanaian Sisters and was accompanying a medical/dental team and a team of audiologists. The following is a post she sent which gives a flavor of what her experience was like. I am sitting here listening to the Muslim “call to prayer” in the neighboring village as I await dinner with the “medical teams.” Many Muslim families came today to see the doctor and dental teams! It was a very hot today and I was minding the heat a lot! Thankfully I had a bit of a respite day today! 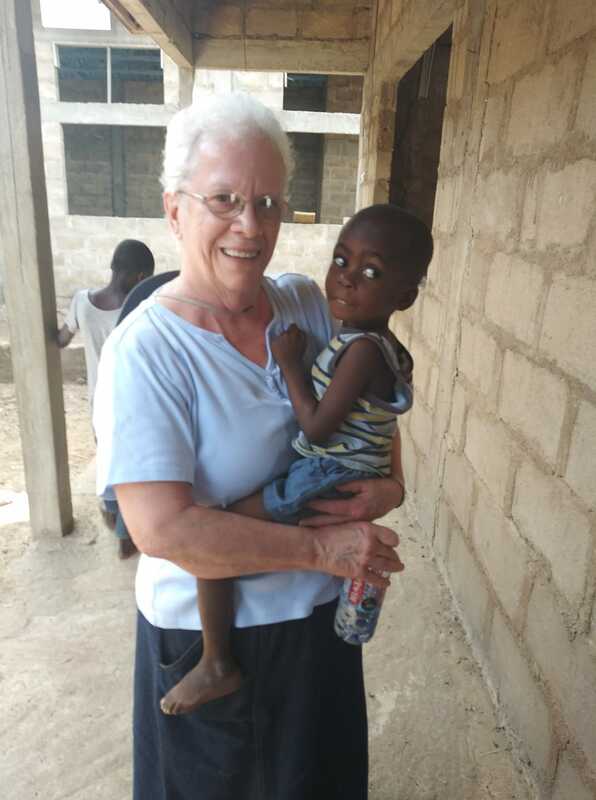 The Sisters we are staying with here are providing care to children that according to the Bishop would not have survived in their families or villages due to cultural superstitions! I am working with three young woman who are studying to be sisters in this local Ghanaian congregation. They are very young and quite take by the fact that I have been a sister for 52 years! They want to know more about religious life, the vows and how to discern if this life is right for them! They have only had a high school education but are eager to learn! Scripture takes on new meanings, like the concept of foot washing in a dry, dusty landscape where most wear sandals! Also, Jesus being temped in the desert! This is very near the Sahara Desert and very desert like. The people are lovely and happy! This is an amazing place! God is very present! Thanks,Mary Liz, for keeping us informed. I’m sure you are learning many new things in a different country. But, those people are opening your eyes in new ways. We look forward to hearing about it all when you return. God bless you sister Mary Elizabeth Luby..you were always a favorite if mine..they are blessed to have you there.